Second painting, white petals instead of pink. 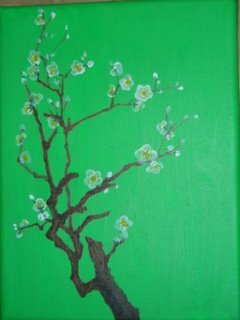 Improvement on the branches which I am happy about. 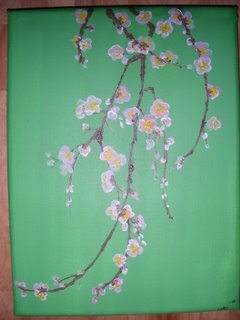 Still need a lot of practice on the flowers, especially on the paint consistency, then is the flower positions. I have yet been able to capture flowers behind branches or partially behind branches, how flowers clusters together and still be able to identify each individual flower whether in whole or partially revealing to sight. Since I can't afford paintings that are tens thousands dollars, and I want to have a large wall size painting, I decided to learn. After spending an hour wandering in an art supply store, taking a "free" lesson from the sales lady, I came home with everything I need as a beginner. With my fascination of Chinese ink painting, but not having the skills to paint in ink on paper or silk, I feel I should translate the ink painting into an Acrylic painting on a canvas. It came out better than I'd hoped for in terms of colors, but my brushes are too cheap to strike clean strokes. Alright, I'll start on the second one, should improve in some way. Blooming prune tree across the wall should go well with the Ching Wedding bed, to create that romantic and classic Chinese ambiance for tea drinking, total escape from the modern day life. Spring buds mixed with 1st grade leaves from Bu Lang Shan. One of the highest grade ripe pu-erh available according to seller. Cake looks very attractive, a lot of young buds, I'd say mostly young buds compressed tightly. 2 grams of leaves were used for the first tasting. It turned out quite weak. So I am using 4 grams of leaves for this posting. 1st brew: 5s, reddish clear, smooth, no aroma, slight sweetness with pleasant wood taste, dry feeling in back of throat, after taste is incense like sweet between tongue and upper mouth. 2nd brew: 5s, dark red, very smooth almost creamy, sweet with a sour note, this could be avoided by using fewer leaves I think. Next tasting will be 3 grams! The sweet flavor is woody though not quite overwhelming as sandal wood, but definitely has the scent and smoky sweetness. 3rd and 4th brew: 5s and 10s, similar to 2nd with the same intensity of flavor, color and texture, sour note is dissipating with successive infusions. It gave up around the 8th brew, it might be able to go on for an other one or 2 brews with longer infusion. After taste is sweet and leave a clean slick mouth feel for quite a while. Although nothing out standing in terms of flavor, but its smoothness is on top of the cooked pu-erhs lists. You just have to be patient with pu-erh... Patience is golden, specially for pu-erh! Good potential for aging this bing. 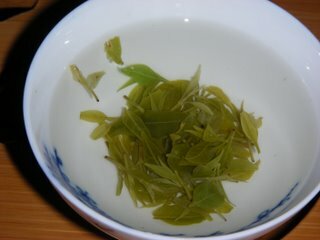 An article by Choudoufu at http://www.squidoo.com/TaiwanTea/ caught my attention. The difference between China and Taiwan tea culture. I don't know how to post my comments on that site, so I write it up on mine. When speaking of Taiwan tea culture, the main stream is Kung Fu tea using tea sets made specifically for this purpose, and the most suitable tea are ooglong, pu-erh, dan cong to name a few. Due to Taiwan's geographic size, there are limited varietals grown on the island. 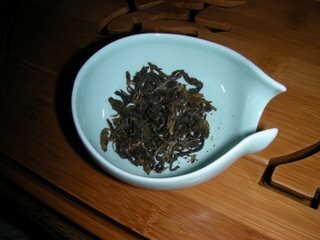 China on the other hand is a very large country geographically, each region/climate produces its own specialty, suitable to drink with kung fu tea ware or not. 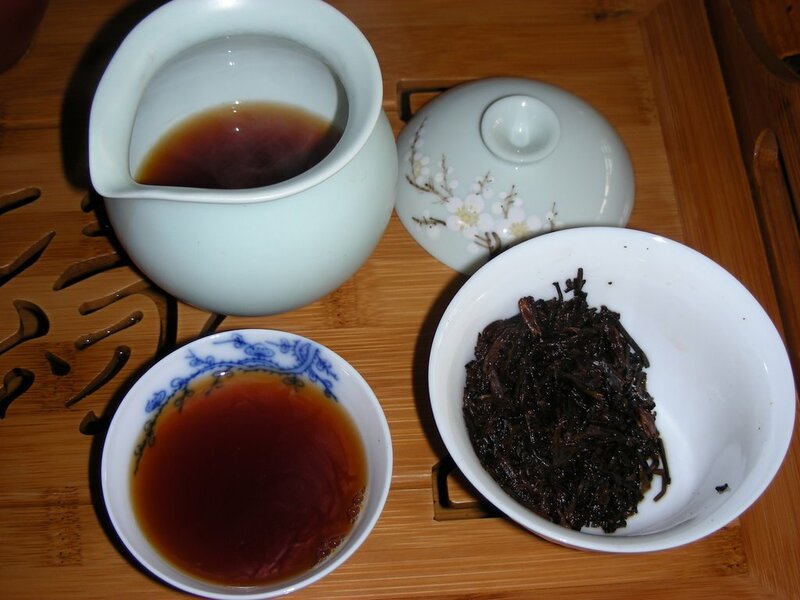 Kung fu tea originate in Fu Jian, also popular in Chao Zhou, yunnan, mainly the southern provinces. 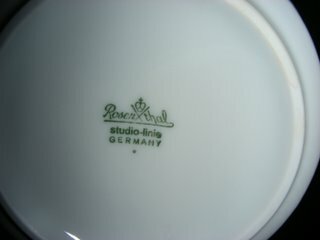 For reasons that the type of tea produced in the region can be complimented by such method and tea ware. 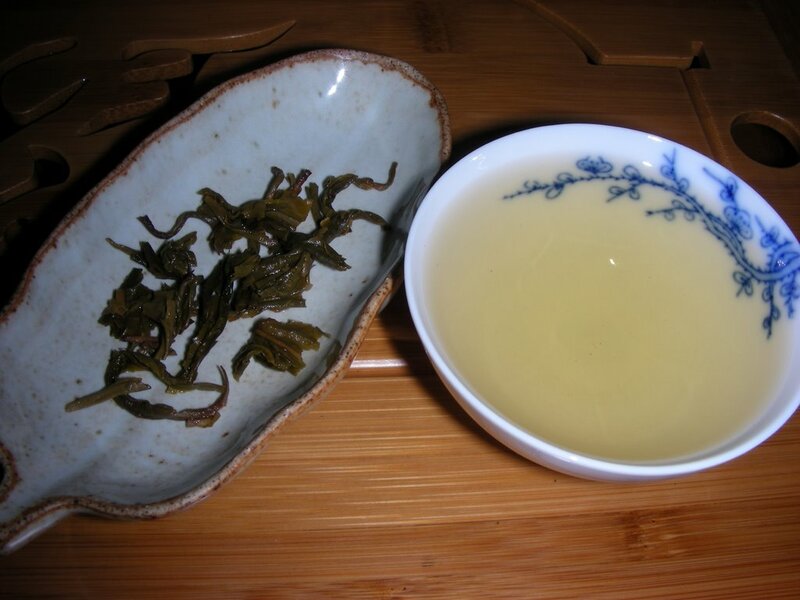 Other regions such as Zhe Jiang, Si Chuan produce Lung Jing and other green tea, which doesn't last infusions after infusions, a cup brewing method is sufficient enough. 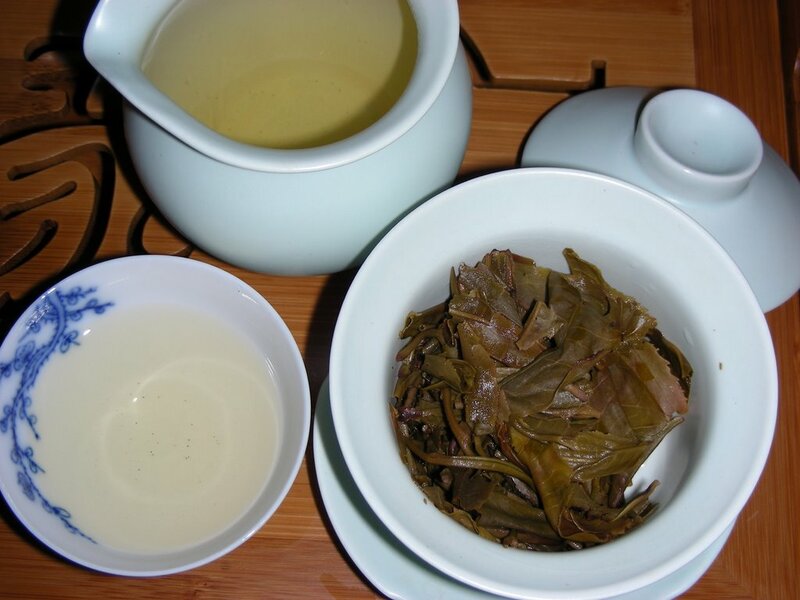 Shang Hai is a Lung Jing drinking city, that's why mostly brewed in a cup both for visitors and at home. 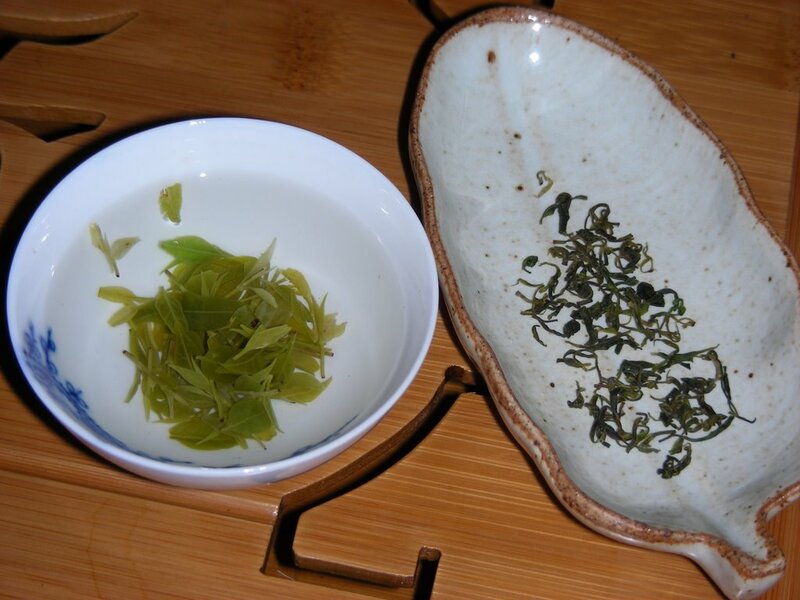 I was growing up drinking Hong Cha (red/black tea) brewed in a large teapot, then poured into cups. Yum Cha with dim sum is a typical Cantonese - Guang Dong province style of tea drinking. Interestingly enough, many Cantonese categorizes loose cooked pu-erh as black tea due to its color. I don't think we are comparing apples to apples here. The development of the tea culture are different between the shores of strait, dictated by political economical influence mostly. War fare since late Ching had slowed down the development in China as a whole. Particularly during Cultural Revolution in mainland China, all forms of art was banished. While trees were still growing and producing, techniques and quality were regressing, only to meet the basic demand of consumers, no more different than salt or rice, it's a necessity. Taiwan had a new crowd of tea drinkers since the independence of the communist party. The relatively calm political environment and international business establishments in Taiwan provided the means to create demands for high quality tea and tea wares. One progressed and the other regressed for a good 30 40 years. Looking back in Chinese tea history, tea culture flourished during Tang, Song, Ming and Ching, dynasties where economically and politically stable. Other times during Chun Chiu, San Guo, Liao, Jin, tea culture development were hauled to a stop mostly. Any forms of art requires financing and demand to flourish, just like the Romans. In the last 20 years, China is catching up although not yet revived in every corner. 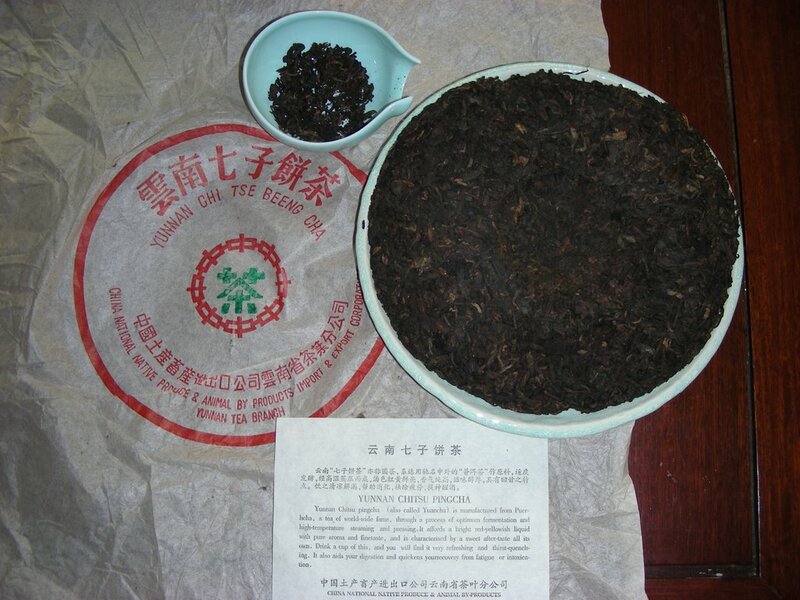 Bidding for 700g (entire crop) of Da Hong Pao from a 800 years old mother tree was 168k RMB years ago. Tea houses are spung up like bamboo shoots after a spring shower in major cities across China nowadays. With modern transportations, it's much easier to mix and blend regional specialties than ever, even though locals might still prefer their regional tea. Tea drinking is a simple pleasure in life, however it is not simple behind the scene. I am thankful for the availability during my life time to pursuit the finer art of such simple pleasure. Drink up every one! My pu-erh orders are here!!! I came home around mid-nite last night from the long Thanksgiving weekend, found 2 large packages from China in the mail box. My heart started pounding as soon as I smell the faint pu-erh aroma leaked through the card board boxes. 72 cakes all together! Imagine my excitement! Yay!!! 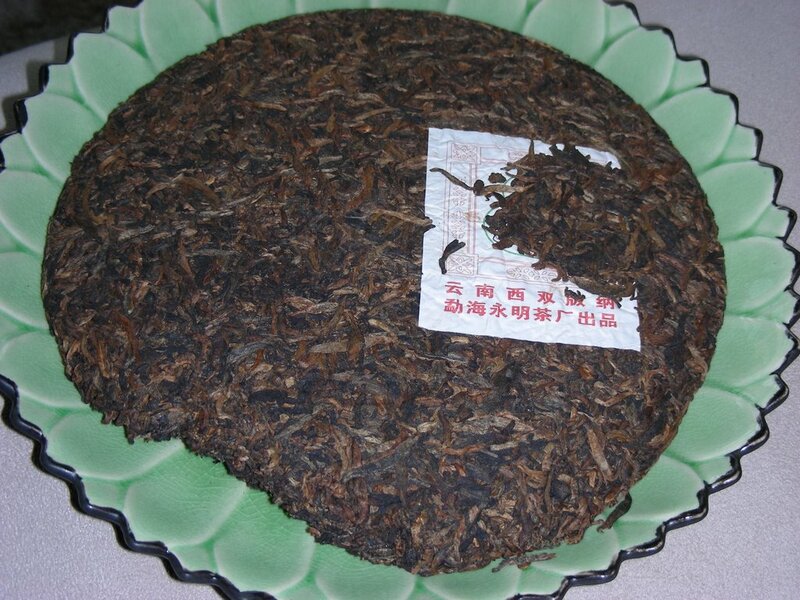 Dry leaves: This cake looks very attractive, a lot of young silver hairy leaves, both on top and bottom of the cake. A sign of quality leaves. 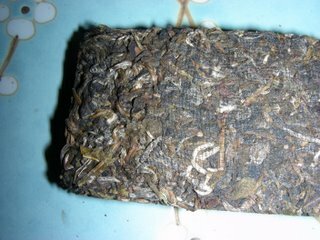 Fresh tobacco mixed with floral or spring forest aroma. Something I notice is the hole in the bottom is not centered nor smooth as it came out of a mold. I am baffled by this irregularity. 1st brew: 10s, golden yellow, fresh tobacco aroma with a hint of sweetness, crisp clean and fresh mouth, sign of typical young pu, the smoky sweet taste gives an aged feel, however a 2006 young pu should be too fresh to have such flavor, unless it's harvested early 2006 and stored with high humidity. I found my other 2006 wild pu starting to give out aging flavor about 1 month ago, provided that I stored it in its own wrapping with a lot of ocean humidity since June. Open leaves: Large leaves, young and tender, reddish brown - a sign of fermentation. I wonder if it's over fermented, therefore gives out more tobacco flavor then it should be. By the size of the leave, it seems like authentic Yunnan large leave wild varietal. I have questions in my mind about this cake. Maybe it will take some time to discover its true flavor with another brewing method. It's still giving out flavor at 10th brew, long lasting. I am not impressed yet at this first tasting. For $37 a cake plus shipping, I am not sure about the flavor at this point. Leaves looking this good with a flavor not measuring up to the PQR (price quality ratio), I hope I can find out more in future tastings. This tea is highly caffeinated, I can feel the effect after more than an hour. After not drinking caffeinated tea for 5 days, I wonder if my body has lowered its tolerance for caffeine?! This is one of few teas that I (as an experienced drinker of raw/Sheng Pu) actually experience a sort of drunken or heightened state when I drink. HA! Now I know why! It's the season! Holidays are coming one after an other. While I am sitting here waiting for the traffic to thin out a bid before I hit the road, just wanna wish you all a happy thanksgiving holiday! Be good, be safe and behave is my motto! If turkey day is not a holiday where you are, have a good rest of the week! Cute little hand painted cup made for china export to the European market, probably in the Ching dynasty. The handle is molded into bamboo shape. 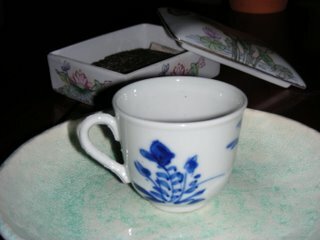 The shape of the cup is in between a traditional Chinese tea up and an espresso cup. 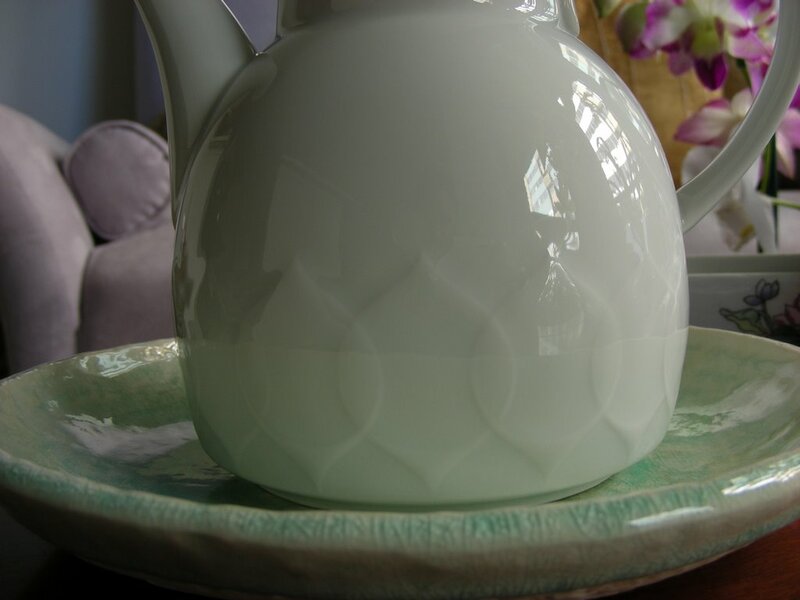 Both the clay and glaze have a slight grayish tone, it's a common clay used during Ming and Ching dynasty. 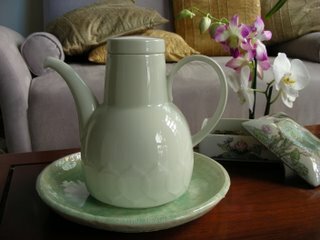 China ware made for foreign markets were poorly made, in terms of designs, craftsmanship, and clay quality. This is a very typical cup has all of those characteristics. My friend who is an antique collector for about 10 years told me it's difficult to find quality authentic antique in mainland China. His collection consist a bronze sword from the chun chiu shi qi, 770 to 476 B.C., the Spring and Autumn Period. Rosenthal makes very nice tea wares. Clay quality is as pure as it can be, design is modern yet functional, good drip control, good water flow as well. I found the same pot on ebay for $89 plus shipping, which I paid only $10 at a local antique shop. A bargain huh! It comes with little drawers in the middle, perfect for storing stationeries and tea utensils. The top of the drawers can be used as book shelf. How ideal!!! 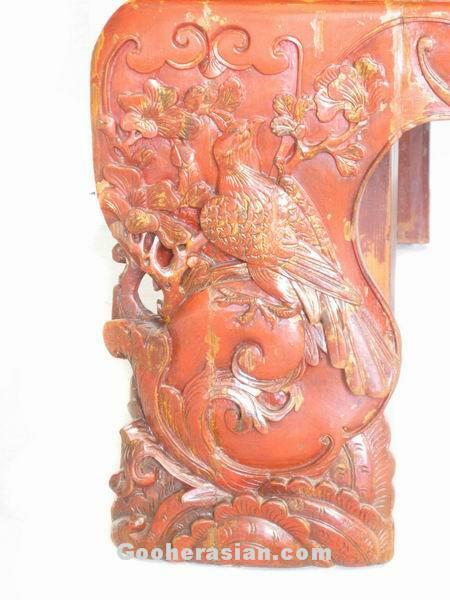 The wood carving here on each footers is a bird on blooming prune tree branch. Xi que 喜鹊 (magpie) literally happy bird, prune flower is Mei Hua, the combination of the 2 in a design is a symbolic notion of Xi Shang Mei Shao 喜上眉梢(happy, up, eyebrows, branch tip). A happy bird up on a prune branch sounds like happiness up on eyebrows in mandarin. I am increasingly more intrigued and fascinated by Chinese literature and its subtle meaning in every phrase. Simply amazing! I contemplated about the phrase Xi shang mei shao in an half asleep state of mind during sleep. Why happiness on eyebrows tip 喜上眉梢? Smile at a mirror and you'll find out why! Facial muscles uplift to the temple area where the tip of the eyebrows are when smiling, see it?! Gosh a little 4 characters phrase containing a story, logic, descriptions of physical reaction and emotion! Endless wisdom in Chinese culture! Antique shopping is always fun. 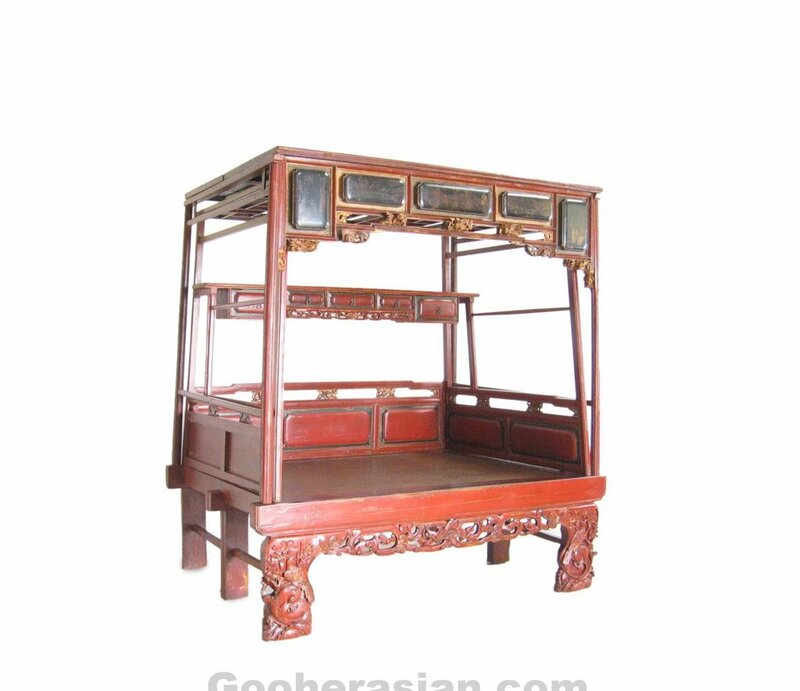 I have an obsession with Chinese antique, be it furniture, china wares, embroidery items. Wait, I have more obsessions than I realize. 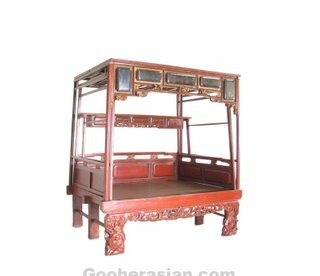 I bought a beautiful Ching dynasty wood carved bed last week. 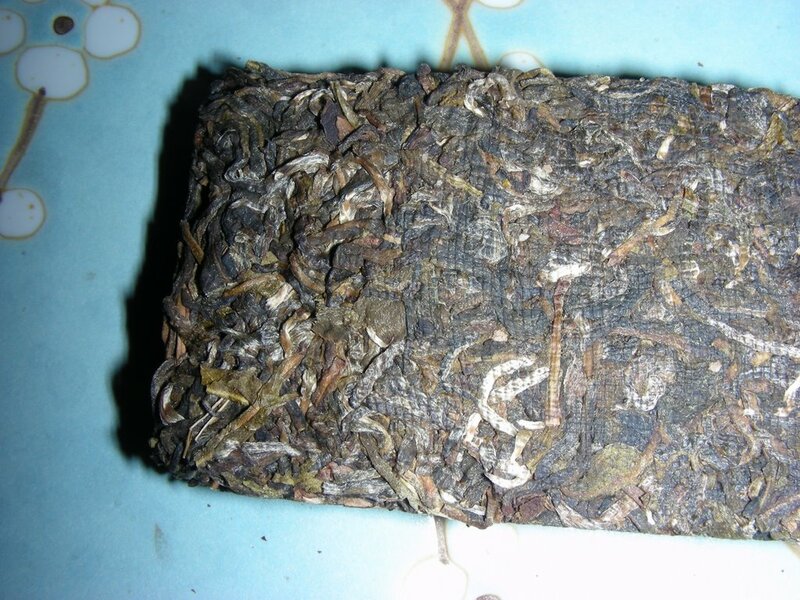 Spending 3 hours at a shop, you bound to get to know the owner a little bit, and vice versa, he gave me a pu-erh cake! He didn't give me much information except he bought a bunch in Yun Nan 2 years ago. Any one can tell the age? It's cooked for all I know. His brother also made oolgong for us. Now, that's good service! I tasted a sample of this pu, seems to me no more than 5 yrs old or even 3, for it lacks the smooth sweetness, strong wood taste. A typical cooked pu-erh that non-Asian and Hongkongnese would drink with milk and sugar. I managed to take a good shot with this new camera. However, I can't seem to get rid of the blue hue as you can see on this white porcelain cup. The clarity is much better though. This Ku ding cha is in small natural dried young leave form instead of the nail form, looks like Bi Luo Chun almost. It taste less bitter than the larger leave nails. Leaves are so young and tender, it's actually edible, refreshing and bitter at the same time, leaving a clean mouth feel. If you like the benefit of the Ku Ding Cha, but less bitterness, this is the one to drink. It's selling for $40 per lb at YHF, normally cost $50 to $60. I am not advertising for YHF, but it is a good deal. Finally my new camera came today. These are the pix I took. There is no comparison to Canon. The picture quality is so poor with flash on, all pictures came out with a blue hue. Perhaps I should give it an other shot in the sun and see how it goes. I am considering buying a Canon and return the Nikon already. I had this tea since June and I just open it for a taste. Seller's note about this tea: Mengku Tea Factory made an expedition to remote area near Banzhang mountain to obtain the leaves for these cakes. The leaves are from trees 400 to 500 years old that were heavily cut during the Cultural Revolution. 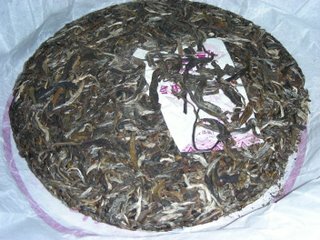 The trunk is still intact and in the 35 years since the trees have continued to grow and produce excellent quality Pu-erh with that special Banzhang taste and penetrating perfume-like aroma. When brewed is golden yellow and takes 10 or more infusions, each infusion with it's own taste and gradually less bitter and ineffably sweet. 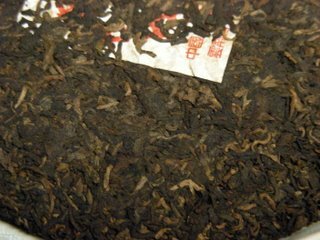 Dry leaves: light aroma resembling tobacco and floral, mixture of young hairy tips and mostly dark green leaves, a few medium green leaves which doesn't look like it's from the same tree. This is one of those nice wild varietals which gives the kind of long lasting aroma I enjoy time after time. It lacks the aged flavor which due to its young age, in time, the glucose should break down enough to give it smooth and sweet taste. I find this tea taste differently when drunk hot or luke warm within the same brew. More floral when hot, and more smoky and smoother when cool.